As a homeowner, few fences provide the security you need while also providing the aesthetic appeal you desire. Steel fences accomplish just that. These aesthetically appealing fences are also some of the most durable fences on the market, making them perfect for the homeowner who wants to improve security along with his or her curb appeal. Curb Appeal: When most people think steel fencing, they do not think curb appeal. However, these fences are actually some of the most breathtaking on the market. The right steel fence adds a certain level of sophistication to a property that wood, vinyl, and aluminum simply cannot compete with. Durability: Steel fences stand the test of time. These durable fences, once installed, are rock solid. Low Maintenance: Unlike wood fences, steel requires very little maintenance throughout its useful life. Steel fences can withstand the test of time. Value: Steel fences also add value to your home, while also lowering your insurance premium. That’s what we call a win-win. 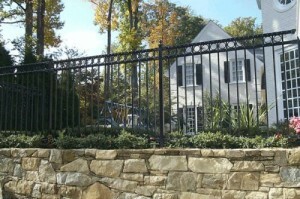 Here at Hercules Fence in Northern Virginia, we pride ourselves on installing high quality fences at affordable prices, from wood and vinyl to aluminum and, of course, steel. How do we provide quality at such a reasonable price? Well, as Virginia’s largest fence company, we are able to buy the fence you want at a price you will love. Our manufacturers offer extended warranties from 12-15 years. We can also provide custom welded panels if you have a unique design in mind. If you have any questions about the Benefits of Steel Fences, please contact Hercules Fence of Northern Virginia today by calling (703)551-2609 or visiting our website. Also, check out Hercules Fence of Manassas on Facebook,Twitter, Google+ and YouTube! This entry was posted on Thursday, October 3rd, 2013 at 7:06 pm. Both comments and pings are currently closed.